In other news, field hockey extends winning run to two games after suffering first defeat. “Burlington Township’s Gracyn Banks dribbles the ball during a Sept. 20 game at Northern Burlington Regional High School. Banks scored twice in the 4–1 win.” LARRY HENRY JR/The Sun. The Burlington Township Lady Falcons extended their record to 5–0 this season, after a 5–0 drubbing of Bordentown on Sept. 19. Last year’s leading scorer Gabriella Senni scored two goals in the win, while Kate Field, Jiselle Daniels, and Lydia Daids all got on the scoresheet. Nicole Binkley chipped in with three assists, while Daids and Brooke Cover each added one apiece. BT led 4–0 at halftime in what was a dominant team performance. 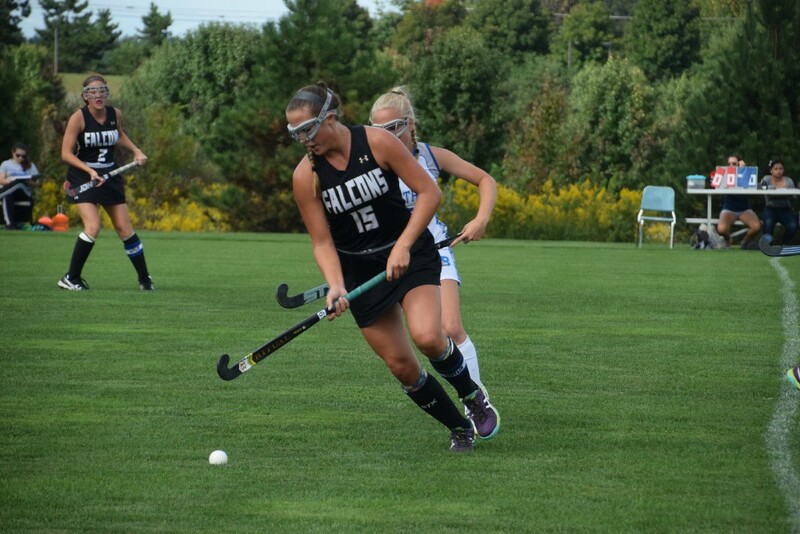 Burlington Township next travels to Cinnaminson on Sept. 22 for a Liberty Division showdown at 3:30 p.m.
After suffering their first loss of the season, the Burlington Township field hockey team has won their last two games. A 3–0 win over Haddon Township on Sept. 18 paired with a 4–1 win over Northern Burlington on Sept. 20 have improved the team’s record to 5–1. Midfielder Gracyn Banks scored twice in Wednesday’s win, extending her goal tally on the season to eight. Banks also leads the team with four assists. The Lady Falcons next travel to Pennsauken on Sept. 22 for a Liberty Division contest at 3:45 p.m. The Burlington Township football team is preparing for a huge contest on Sept. 22 vs. Liberty Division rivals Lenape. The Falcons have started nicely this season, winning their first two games over Notre Dame 29–6 and Paul VI 50–26 respectively. Quarterback Daniel Grozozsky has thrown for 311 yards so far this season, with four touchdowns to zero interceptions. Tailback Semi Robertson has 160 yards on the ground with three scores, while Justin Johnson has 150 yards receiving. Kadin Pegram has 109 yards and three receiving touchdowns as well. This match will feature two 2–0 sides, who finished one and two in the Liberty Division standings a year ago. Lenape finished 2016 with an 11–1 record and the Liberty Division crown, before eventually falling in the S.J. Group V title game to Timber Creek 31–10. Kickoff is at 7 p.m. on Sept. 22 at Burlington Township High School.